With the Olympics coming up and summer well underway, there is plenty of motivation to start exercising. But before hitting the track, studio or gym to try to emulate the stars of Team USA, experts have warned that women should start by kitting themselves out with a good sports bra. “Usually it’s a cup of coffee and a smoothie (0% Greek yogurt, organic peanut butter, and celery). It’s not the best-tasting smoothie, but it’s filled with protein. I also take a multivitamin and a probiotic with breakfast.” — Dr. Febin Melepura, pain specialist of Sports Injury & Pain Management Clinic of New York. When athletes get hurt, their initial thought is often to enlist the services of an orthopedist. But that shouldn’t always be the first line of defense. Another option—and in conjunction with a joints doctor—is seeing a pain specialist. 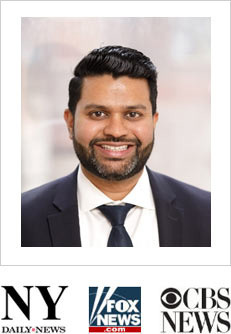 So for the latest installment of our “3 Questions for a Doctor” series, we spoke with Febin Melepura, M.D., a New York-based sports injury physician who’s double board certified in pain management and anesthesiology, to find out more about the field. The most common injury I see at the office is low back injury, followed by neck injury, then shoulder and knee. Low back pain is an extremely common problem that affects at least 80 percent of all individuals at some point in their lives, and is the fifth most common reason for all physician visits in the United States. There are more minimally invasive surgical techniques that help patients regain their functionality more quickly. Additionally, we now use spinal cord stimulators to help chronic pain patients from suffering. The device changes how they perceive pain by altering how the nervous system sends painful signals to the brain. Should You Use E-Stim Devices At Home? If you’ve ever been hooked up with electrodes that make your muscles twitch, chances are the treatment occurred in a physical therapist’s office. But recently, small stimulation machines that deliver an electrical current, often called e-stim for short, are becoming commonplace at event expos, health fairs and sporting goods retailers—with home use as the goal. We’ve seen a proliferation of these devices, but we were curious…do they really work? If so, how does a runner know if she needs one? We turned to a couple of experts: NYC-based pain specialist Dr. Febin Melepura and San Diego physical therapist Chelsea Best to get some answers. Febin Melepura, MD, of New York City-based Stanford Pain & Sports Medicine, explains pain management physicians are plagued by several challenges when treating patients, ranging from spiraling healthcare costs and increased bureaucracy for diagnostic and therapeutic interventions. Despite these challenges, the pain management field is undergoing tremendous transformations with providers utilizing new techniques. Research is flooding the industry, allowing pain management specialists to better understand the source of a patient’s pain. Treatments are tailored toward a patient, with interventions becoming increasingly precise. “There are more minimally invasive surgical techniques that help patients regain their functionality more quickly. Additionally, we now use spinal cord stimulators for neuromodulations and help chronic pain patients from suffering,” Dr. Melepura says.